The following's a brief overview of what the RDX autoloader will look like. As mentioned previously, it's timeframe is approximately mid-March and it will hold up to eight RDX removable hard drive cartridges. The current RDX cartridge capacities of 1TB, 750GB, 640GB, 500GB, 320GB and 160GB will give the configuration a minimum capacity of 160GB and a maximum (based on today's capacities) of 8TB. 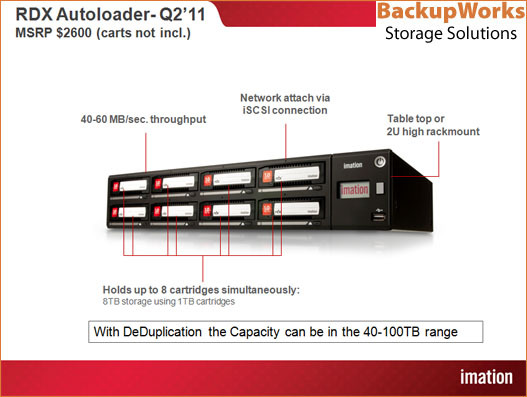 And the ability to remove carts at any time provides no limit to the total amount of storage used within the configuration. The device can be used in either "autoloader mode" or JBOD. Definitely targeting this type of configuration on server installations that will require backup and which don't cross into the "need for tape backup", which are mostly used in larger and enterprise-sized environments.